Water, sand and dirt proof, to keep your items clean and protected at all times! This Korjo Waterproof Phone Pouch has been designed to keep your personal items safe and protected no matter where your adventure takes you. Simply place your camera or smartphone inside the pouch, and you are free to use it as per usual! The transparent case allows the touchscreen to be used, as well as having an air filled border for floatation. Make and receive calls with ease whilst you phone is in the pouch, and then take some photos through the clear lens window! 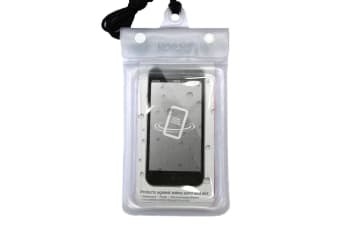 Fit for all adventures big and small, this Korjo Waterproof Phone Pouch is an essential for every trip.